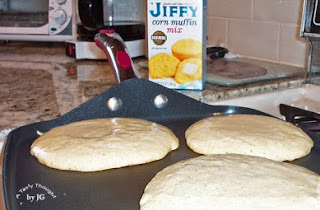 In and With a "Jiffy"
Jiffy Corn Muffins are a family fave here, so I usually have a box or two of the mix in my pantry. Growing up these muffins were a staple, but we never tasted the pancakes. However, located on the side of the box are the directions. For many years I never glanced at them and I really don't know why. Now, I do prepare these pancakes, but always substitute Olive Oil, 2 Egg Whites and Soy Milk when whipping them up. For a great tasting cornmeal pancake I also add in 1/4 teaspoon Cinnamon and 1/4 teaspoon Nutmeg to the batter. In the above photo the light colored pancakes have little bubbles and are ready to flip over. The extras (shown below) are now in my freezer for another quick breakfast this week. 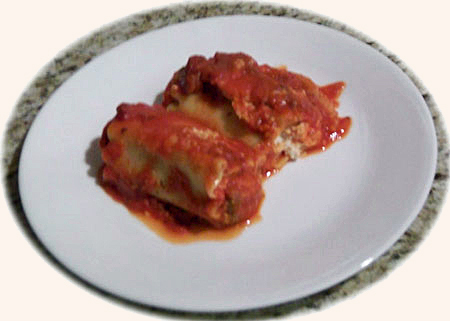 Two nights ago I baked a batch of this meatless family favorite (made with Lasagna noodles that have been cut in half). After dinner the remaining portions were placed in single serving Ziploc containers and into my freezer they went. Individual portions will be reheated in my microwave for a quick dinner on busy nights. If reheating, I add a little more tomato sauce. Served with a veggie salad and Garlic Parmesan Toast. Yum! (2) 1 lb. containers of Ricotta Cheese - I use Fat Free + Part Skim. 8 oz. Shredded Mozzarella Cheese - I use Part Skim. 1 jar Spaghetti Sauce - about 24 oz. Spray a Glass Baking Dish (about 8"x11") with PAM. Spread about 1 Cup Sauce in baking dish. In large bowl mix Ricotta, Mozzarella, Bread Crumbs and Egg Whites. Place 2 Lasagna Noodles on a large dish and cut each in half. Spread 2-3 Tablespoons Cheese mixture on 2/3 of each noodle. Roll Noodle from filled side to end. Place in baking dish seam side down. Continue filling noodles. Two rows of Rollups in dish. I also place 4 Rollups in middle of baking dish, if extra. Pour sauce over top and on edges of filled Rollups, spread sauce evenly. Bake in oven for about 35 Minutes. Does your family enjoy dinners with pasta and tomato sauce? Valentine's Day is a few days away. I do know what scrumptious dessert I'll be baking in two days. 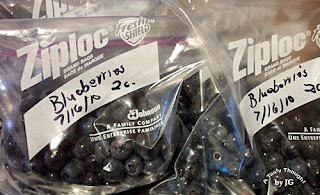 The Blueberries that I'll be using are in my freezer and they will be defrosted in my fridge. Yes, fresh berries can be used, but in my freezer is my year's supply - just ready to use. This is one of those times! For many years I have baked a very tempting blueberry dessert, but never had realized how much my family really enjoyed it. I've always baked yummy goodies, and we've always eaten them very quickly. While growing up, my sons always had hearty appetites. I knew my family always enjoyed the taste of Blueberries and cake combined with vanilla ice cream. A few years ago one of my sons was "back home" working very late hours. He would return to our home in the wee hours of the morn after work and reheat his dinner. One night we had Blueberry Delisimo for dessert. My ravenous son sat down with the smaller of my Rose Colored Pyrex baking dishes that contained this dessert and he devoured the remaining half - before he realized it. He totally forgot about the nutritious dinner waiting to be placed in the microwave. The next AM I saw the cleaned Pyrex in the dish rack. 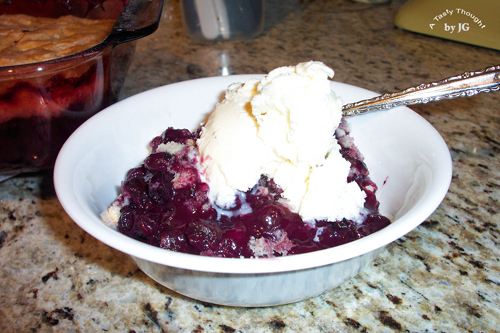 From that moment on I've called this dessert "Blueberry Delisimo." Occasionally if there is time the day before when we are driving in to visit him & his family, a Delisimo that has been baked in a Glad OvenWare container (by following directions for usage) makes the trip down the Mass Pike with my DH and I. 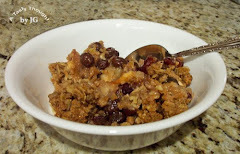 This dessert will always be a favorite in my family! ***Before placing the unbaked Delisimo in the oven it is not unusual to question how a delicious dessert would ever result from the scene going on in the baking dish. Oh, but it does! When making this mouthwatering dessert, do not be fooled by the "place water over the top" method. It all works! Sprinkle with Tapioca and Lemon Juice. Bake at 350°F for 50 - 60 Minutes - until brown on top. Serve when cooled with vanilla ice cream. 'Tis the season for a Snow Rake? This morning when I took a quick glance at our outdoor grill, very little of the black fixture was visible. 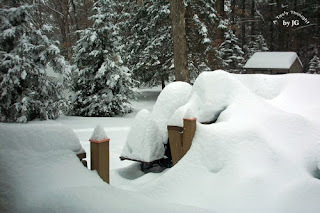 Several mounds of snow totally covered our sturdy deck as if teasing me that I would not be enjoying Grilled Haddock any time soon. 'Tis the season for a Snow Rake?? It sure is!! Back in the winter of '95/'96 my creative hubby crafted a makeshift Snow Rake. It was the winter that we have never forgotten - the snowflakes fell weekly. There was no melting action going on - at all. Homes had roofs that were overly burdened by the weight of heavy snow. By using this tool, snow could be removed on a roof's edges (without climbing up) to lessen the burden and perhaps also negate any water damage that might occur. That handy makeshift Snow Rake was tucked away in a corner of our shed (visible just beyond our deck). In the past three days it has come to our rescue! While I may daydream about enjoying a dinner of Grilled Sockeye Salmon, my Slow Cooker is bubbling away in my toasty kitchen. Beef Stew was so easy to prep this afternoon. It is a reminder of my mom's stew that bubbled away on the heater side of our old-fashioned gas stove. She placed everything into a covered Dutch Oven and simmered it for 8 - 10 hours. Occasionally, a large spoon mixed the contents. I use my West Bend Slow Cooker and I set it on High for 4 Hours. Always keeping that wonderful memory whenever I make Beef Stew, I add the ingredients into my Slow Cooker's pot (that has been sprayed with PAM). Because of the experience of scorching meat if I place it on the bottom of the pot, I place 1 lb. Baby Carrots on the bottom, then the meat. A 1 lb. Beef Round is cut into small chunks and placed on top. Then, (1) 16 oz. bag defrosted Mixed Vegetables, 2 Potatoes (cut into small chunks) and (2) cans Tomatoes (about 15 oz. each, in juice) are added. 3 Bay Leaves along with Parsley, chopped Onions, Oregano, Garlic Powder & Sweet Basil are sprinkled on top. Before placing the lid on the Slow Cooker I add in (2) cans Tomato Sauce (about 15 oz. each). Sometimes I sprinkle a little Pepper on top. After all ingredients are placed in the pot, they simmer away. A no fuss dinner on a very cold night! I may daydream of using our outdoor grill while my DH is using the Snow Rake, but Beef Stew in the winter is the best!